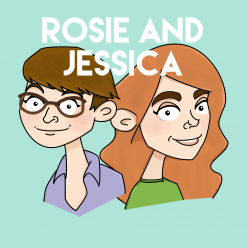 In episode 59, Rosie and Jessica announce a podcast road-trip, struggle with an “audio only” recording, and may or may not be wearing muumuus. There’s a report from afternoon tea, some a debatable flavour of crumble and their Top 5 Boardgames, which reveals quite a lot about their characters and why you should never fall asleep near them if they have access to lots of shoes. Jessica picked Piece of My Heart by Jackie Jormp-Jomp – sorry – Janis Joplin, while Rosie went for Icebreaker by Seafoxes, heard on the June 2015 Folkcast. Why not play Human Hungry Hippos at your next party? Can you hear our hearts saying hi? The Children’s Literature Reshuffle as it happened.